U.S. Customs and Border Protection personnel along with DOD personnel at the San Ysidro Port of Entry, November 2018. Photo by Mani Albrecht, US Government Work. Tear Gas? This Is America. More than 7,000 Central American migrants are currently in Baja California, Mexico, waiting to apply for U.S. asylum. They have traveled thousands of miles, fleeing violence and political crisis the U.S. helped to create (the U.S. supported a 2009 Honduran coup that drove out the democratically elected government of President Manuel Zelaya and led to wide-scale violence in Honduras and its surrounding areas). 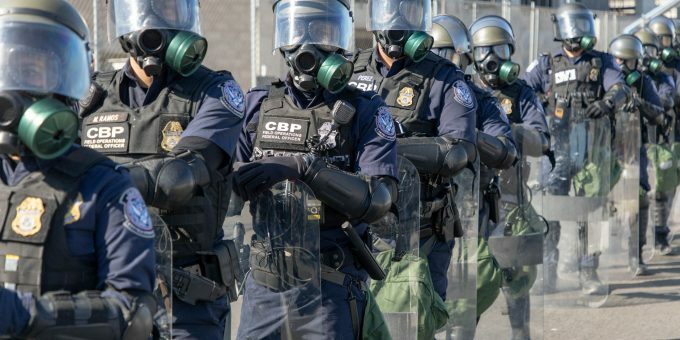 In response to this incoming wave of migrants, the U.S. Department of Homeland Security (DHS) has encouraged people to seek asylum at ports of entry instead of at other points along the border, and Central Americans are following that directive. Predictably, the DHS is behind on processing these claims. On Sunday, November 25, asylum seekers grew at the border began to protest the delays. In response, the San Ysidro port of entry, one of the busiest in the western hemisphere, was closed. U.S. agents fired tear gas and rubber bullets at asylum-seekers trying to cross into the U.S. By the end of the day, both sides of the issue were up in arms: some pointed to the asylum-seekers as invaders, some were appalled at the U.S. response to people they see as refugees, and many expressed their dismay at the America they were beginning to see. American identity is assumed to be White, Anglo-Saxon, and Christian. Anyone that doesn’t fit this profile is othered and scrutinized. The vision of who Americans are—and can be and should be—is always shaped by policies that dictate entry, removal, access to citizenship, and constitutional rights in the U.S. These processes have been and undeniably remain shaped by race, ethnicity, and religion.The vision of who Americans are—and can be and should be—is always shaped by policies that dictate entry, removal, access to citizenship, and constitutional rights in the U.S. These processes have been and undeniably remain shaped by race, ethnicity, and religion. Below, a review of exclusionary U.S. immigration policies. 1790: U.S. Congress passed the Naturalization Act of 1790 which limited citizenship through naturalization to “free White persons” of good moral character who had been in the U.S. for at least two years. The Supreme Court would subsequently rule on what constitutes a “White” person several times. Rooted in biological races, a White person was first considered to be someone who “of the Caucasian race.” But after S. v. Bhagat Singh Thind, the Supreme Court ruled that whiteness was, rather than rooted in biology, a matter of “what the common man said whiteness was.” During this same time, African Americans were enslaved and Native Americans were subjected to genocide and removal from their land. 1882: U.S. Congress passed the Chinese Exclusion Act. This act established an absolute 10-year halt on the immigration of skilled and unskilled Chinese laborers. The act also placed new restrictions on Chinese who had already entered the country: If they left, they had to obtain new certification to re-enter. For the first time, Federal law forbid entry of an entire ethnic group, under the rationale that the presence of Chinese laborers would threaten certain labor markets. 1917: U.S. Congress overrode a presidential veto to pass the Immigration Act of 1917. It built upon the Chinese Exclusion act and barred immigration of “undesirables” and anyone from the Asiatic Barred Zone or “any country not owned by the U.S. adjacent to the continent of Asia.” The act was also notable for its literacy test component: To be eligible for immigration to the U.S., anyone over the age of 16 had to prove they were capable of reading 30 to 40 words. 1924: The Immigration Act of 1924, also known as the Johnson-Reed Act, enacted a national origins quota on immigration. This system allowed visas to 2% of the total number of people of each nationality in the U.S. as reflected in the 1890 decennial census. Once again, it excluded Asian immigrants. Linking immigration eligibility to the definition of whiteness at the time, the act also included a provision that excluded anyone ineligible for citizenship on account of their race. These acts were signed into law to preserve the White Americanness of the United States. 1942: During World War II, Executive Order 9066 was signed by President Roosevelt, giving the U.S. military instruction to ban and relocate any person of Japanese ancestry, including those who were U.S. citizens, from a 60-mile wide coastal stretch along the Western seaboard. Thousands of Japanese Americans and immigrants were transported to government-run internment camps. The last internment camp was not closed until the end of 1945. 1952: President Truman vetoed The Immigration and Nationality Act of 1952, believing it to be discriminatory, but Congress overrode the veto and it was passed into law. It continued the national quota system but allocated 50% of each nation’s quota to highly skilled workers. It also gave preferential treatment to relatives of U.S. citizens and permanent residents. While this Act lifted the remaining bans on Asian immigration, it constructed quota systems on Asian nations based on race rather than nationality. A person with a parent from an Asian nation, regardless of their country of citizenship, would be counted against that Asian country’s yearly quota. 1942 to 1964: The Bracero Program was used to recruit temporary agricultural workers from Mexico who were needed to fill farm-labor shortages in the U.S. as a result of World War II. 4.6 million Mexican guest workers were admitted to the U.S. The program was ended in 1964, and after 22 years of the program, all Bracero workers were asked to leave the country. Because farmers still needed workers and workers needed jobs, Mexican workers continued to work in the U.S., now with no legal protections. 1965: The Immigration and Naturalization Act of 1965, also known as the Hart-Celler Act, ended the quota system based on national origin and established preference for immigrants who were family members of citizens or permanent residents. It also aimed to attract skilled labor to the U.S.
1986: The Immigration Reform and Control Act (IRCA) tried to deter undocumented immigration by providing amnesty and temporary status to all immigrants who had lived in the U.S. continuously since before January 1, 1982; provided a more lenient amnesty to farmworkers; imposed sanctions on employers who knowingly recruited undocumented immigrants; and increased enforcement at U.S. borders. Anthropologist Leo R. Chavez argues that the “Latino Threat Narrative” portrays Latinos as incapable of integrating into U.S. society. Thus, they are framed as an invading force that intends to destroy the American way of life. This narrative is a “cultural dark matter” filling debates about immigration, citizenship, and the U.S. nation state with taken-for-granted “truths” about Latinos as a group. As a result, Latino immigrants and native Latinos alike are targets of potential immigration enforcement. They are also prominently featured in media spectacles any time immigration is the topic of conversation. The pervasiveness of the Latino Threat Narrative is precisely what Donald Trump banked on from the beginning of his presidential bid. It seems to have worked. Trump has also vehemently attacked Muslims and African Americans. On January 27, 2017, he signed Executive Order 13769, otherwise known as the Muslim Travel Ban, which banned people from seven predominantly Muslim countries from entering the country for 90 days, suspended entry of all Syrian refugees indefinitely, and forbid any other refugees from entering the country for 120 days. This ban has undergone three iterations and was upheld by the Supreme Court on June 26, 2018. In 2018, 2,654 children were separated from their parents at the U.S.-Mexico border after Trump issued a “no tolerance” immigration policy. On June 26, 2018, U.S. District Court Judge Dana Sabraw ordered this practice ended and all children reunited with their parents within 30 days. While most of these children have been reunited with their parents, 125 children will stay in the U.S. and seek asylum while living with other family or U.S. sponsors, and 120 children are still awaiting reunification with their parents. One exception has opened a loophole: children can be removed from their parents if they were in danger. In the last three months, lawyers have discovered at least 16 new cases of children being separated from their parents under the rationale that their parents, as undocumented residents (even if they are actively seeking asylum), are technically criminals and this places their children in danger. The United States has a long history of using any means necessary to exclude non-White groups from entry—and from the idea of Americanness. As with the 7,000 Central American refugees currently seeking safe-haven, the U.S. often makes false promises of help to potential refugees when it engages in foreign policy programs meant to influence political regimes. And when non-White groups do make it into the country, they face significant barriers in equitable access to education, healthcare, housing, and employment. For those shocked at the images of tear gas unleashed on vulnerable would-be migrants on November 25th, for those who call this response “un-American,” I urge you to reconsider your surprise: the relationship the U.S. has with non-White, non-European immigrants, as well as its native peoples, reveals that closing the port of entry on thousands of asylum-seekers is as American as apple pie.The relationship the U.S. has with non-White, non-European immigrants, as well as its native peoples, reveals that closing the port of entry on thousands of asylum-seekers is as American as apple pie. Chandra Reyna is in the sociology program at the University of Maryland. She studies Latinx families, racial identity, and racialization. site's rankings, it critical to get back-links from sites with good page rank numbers.